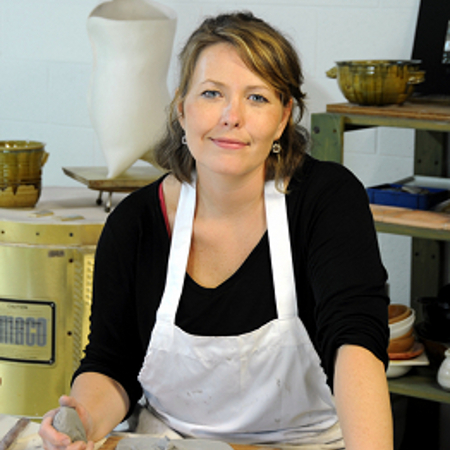 Rhoda Kahler is a ceramic artist living in West Chester, Pennsylvania. Her tile work has been featured in magazines, newspapers and on television, including on the Home and Garden Television network (HGTV). Rhoda created the centennial tiles for the Delaware Art Museum in her Alphabet City motif. Most recently, she finished a Guest Artist Residency at the Philadelphia Museum of Art for their Form and Art Program. Drawing from nature, much of her art bends toward the organic, making use of abstraction and collage. There is a tactile intimacy that is translated through the mud between her fingers to her pieces that beg to be touched. Her handmade tile murals appear in public and private collections throughout the Delaware Valley—her most recent murals are located on the new E.O.Bull Center for the Arts at West Chester University. One of these exterior walls spans 85 feet x 15 feet, covered in handmade tile and other shards with a painted background. Other murals include the Chester County Chamber of Business and Industry and the Historical Kearsley Building in Philadelphia, among other sites. Rhoda has also taught classes and workshops at the Philadelphia Museum of Art, at regional art centers and has participated in a wide range of Resident Artist programs. An occasional adjunct faculty member at West Chester University, she graduated from WCU in 1995 with a Bachelor of Fine Arts degree. Rhoda exhibits her hand-sculpted tiles and sculpture regularly at fine art galleries while also working on her commissioned tile work.